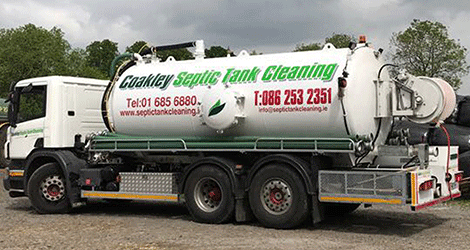 Client: John Coakley runs a cleaning service for septic tanks in Dublin, Meath and Kildare in Ireland. 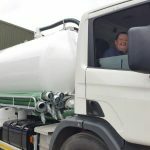 Challenge: John and his team needed a larger unit for his work and preferred to move away from a tractor drawn tanker to improve accessibility for his customers. 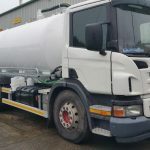 Solution: John had already purchased a 2006 Scania P310 Truck which was formally used as a milk truck. 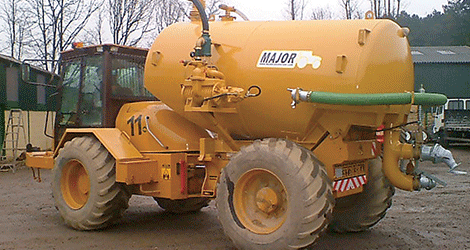 The old tanker was removed from the truck body and replaced with a custom designed Major 2960 gallon tanker. 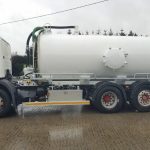 (3) 60 gallons hydraulic oil. 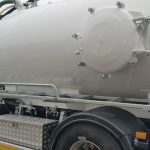 The cold water behind the hydraulic oil tank would assist in keeping the oil cool. 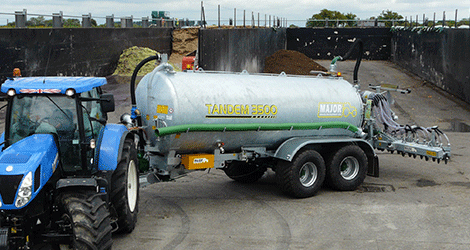 The sludge tank is filled and emptied by means of a hydraulically driven 11,000-litre vacuum pump. 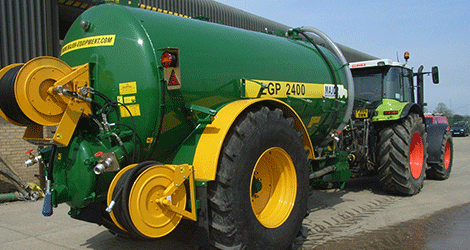 The pump exhausts through a muffler box for reduced noise and odour. 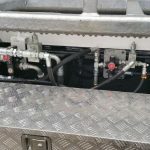 An uprated hydraulic pump and PTO system were fitted to the truck in order to deliver the required hydraulic power. 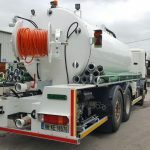 The 400 gallon freshwater tank is filled from a fire hydrant instantaneous coupling but also has a standard garden hose fitting for use in emergency. 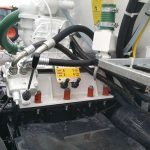 Water levels can be monitored using a full length sight tube attached. 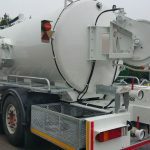 A separate Lombardini 26hp diesel power-washer is mounted at the rear of the truck. This delivers 30 litres of water per minute at 3000psi. 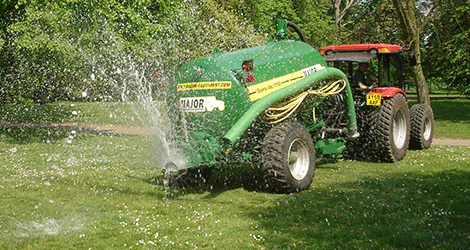 The water tank is not pressurised and the power-washer is gravity/suction fed. 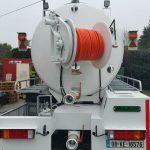 A substantial bespoke hose-reel is attached to the rear of the tanker. 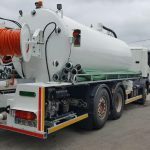 This hydraulically driven reel has 80M of jetting hose for drain cleaning and jetting. 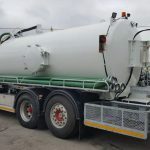 To allow one-man operation there is a radio fob control system allowing the operator at the drain site to divert the water back to the tank while he returns to the truck to shut off the washer engine. 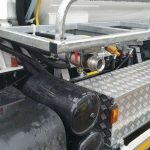 70M of 100mm suction hose was supplied in lengths suitable for storage on the galvanised side trays. All fittings are Bauer. A large toolbox and tool basket were fitted. 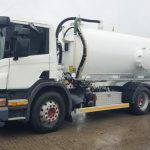 The truck chassis was repainted and the rear end was sheeted and finished off to an impressive standard.